Start off your visit on the 6th (Sat): examine the collection at de Young Museum, then take in the views from Golden Gate Bridge, then wander the streets of Fisherman's Wharf, and finally head off the coast to Alcatraz Island. Here are some ideas for day two: get curious at Exploratorium and then explore and take pictures at Golden Gate Park. 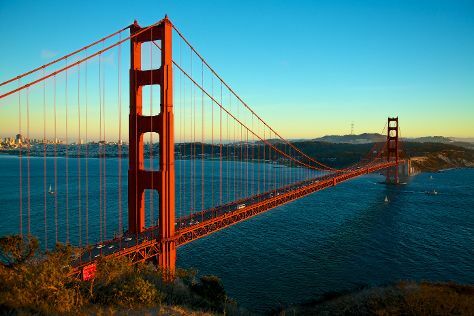 To see where to stay, maps, reviews, and more tourist information, go to the San Francisco trip website . Newark to San Francisco is an approximately 7-hour flight. You can also do a combination of train and flight; or drive. The time zone changes from Eastern Standard Time to Pacific Standard Time, which is usually a -3 hour difference. Traveling from Newark in April, expect a bit warmer with lows of 51°F in San Francisco. Wrap up your sightseeing on the 8th (Mon) early enough to travel to San Diego. Pack the 8th (Mon) with family-friendly diversions at SeaWorld San Diego. There's still lots to do: tour the pleasant surroundings at San Diego Zoo, kick back and relax at La Jolla Cove, see the interesting displays at USS Midway Museum, and let little ones run wild at Balboa Park. To find where to stay, reviews, more things to do, and other tourist information, read our San Diego online journey planner . Traveling by flight from San Francisco to San Diego takes 3.5 hours. Alternatively, you can do a combination of train and flight; or drive. Traveling from San Francisco in April, you can expect nighttime temperatures to be somewhat warmer in San Diego, with lows of 58°F. Finish your sightseeing early on the 11th (Thu) to allow enough time to travel to New Orleans. On the 12th (Fri), hike along Bright Angel Trail. Keep things going the next day: get great views at Powell Point and then explore the stunning scenery at Grand Canyon South Rim. For where to stay, other places to visit, maps, and more tourist information, you can read our Grand Canyon National Park tour itinerary maker website . Traveling by combination of flight and bus from San Diego to Grand Canyon National Park takes 8 hours. Alternatively, you can drive; or do a combination of flight and shuttle. The time zone difference when traveling from San Diego to Grand Canyon National Park is 1 hour. Expect a bit cooler weather when traveling from San Diego in April: highs in Grand Canyon National Park hover around 62°F, while lows dip to 26°F. Wrap up your sightseeing by early afternoon on the 13th (Sat) to allow enough time to travel to New Orleans. New Orleans is known for historic sites, museums, nightlife, shopping, and parks. Your plan includes some of its best attractions: brush up on your military savvy at The National WWII Museum, appreciate the extensive heritage of Garden District, meet the residents at Audubon Aquarium of the Americas, and contemplate in the serene atmosphere at St. Louis Cathedral. To find reviews, where to stay, traveler tips, and more tourist information, go to the New Orleans road trip site . You can do a combination of bus and flight from Grand Canyon National Park to New Orleans in 10.5 hours. Other options are to do a combination of shuttle and flight; or drive. The time zone changes from Mountain Standard Time to Central Standard Time, which is usually a 1 hour difference. When traveling from Grand Canyon National Park in April, plan for somewhat warmer days and warmer nights in New Orleans: temperatures range from 71°F by day to 71°F at night. Finish your sightseeing early on the 17th (Wed) to allow enough time to travel back home.